Point-and-shoot digital still cameras have been able to capture video for years, and now, the latest crop of DSLRs distinguish themselves by their video capabilities in addition to how well they capture stills. Even mobile phones like the iPhone 4 can shoot HD video. But the choices for people looking to edit that video are surprisingly limited. iMovie ‘09 ( ) is geared toward making short, easily shared clips, but Apple lost many fans when it completely retooled iMovie after version 6. Final Cut Express ( ) provides plenty of power, but carries a significant learning curve for people who aren't versed in the language of video editing. And high-end tools like Final Cut Pro ( ) or Adobe Premiere Pro CS5 ( ) are typically too advanced and expensive for casual shooters. With the new Premiere Elements 9, Adobe offers an alternative that provides much more editing capability than iMovie, but with a somewhat easier editing interface than Final Cut Express (at least, when using its Sceneline mode). And at $100, Premiere Elements is also half the cost or less (when bundled with Photoshop Elements 9), of Final Cut Express. iMovie is free with the purchase of a new Mac or $79 as part of iLife. Although Premiere Elements has been refined over many iterations under Windows, this release marks its first appearance on the Mac. As a result, this “new” product isn’t starting off as a bare-bones editor (think iMovie 8). That said, despite its expanded editing power, the program can quickly become complex—which is both good and bad, depending on what you’re expecting—and its easy-editing mode is hampered by annoyances that magnify with use. For casual users who want to start editing video without fully committing to a traditional multi-track timeline (or even know what such a thing is), Premiere Elements offers the Sceneline. Each clip added to the Sceneline is represented by a single thumbnail, with transition icons separating each clip. You simply drag clips from the Organize panel to populate the movie. The Sceneline presents a less intimidating version of a project than the Timeline panel. 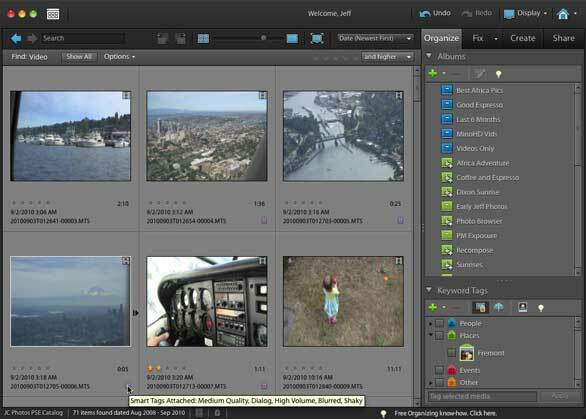 This environment, and other features of Premiere Elements, reflects the software’s focus on doing much of the work for people who don’t want to delve into the complexities of video editing. However, even novices can’t escape complexity in Premiere Elements. When you start a new project, camera settings are automatically selected for you (or match the settings used for the previous project). There's an option in the New Project dialog to specify which video settings to use, and while the list of formats are clearly laid out, there are gaps. For example, the iPhone is missing, as is a clear option for my Canon PowerShot G11, which records in 640-by-480 resolution at 30 frames per second (fps). I needed to drill down into the list, looking at resolution specs, something that most casual users are probably not familiar with. I’m not asking that Adobe include profiles for every camera on the market, but a broader selection that matched popular models would be less confusing. Most casual users will be baffled by this jargony list of video settings. There's good news past that potential confusion, however, because it shouldn't actually matter which format you choose—something that's not immediately apparent, leading users to wonder if they're doing something wrong. If the format of the first clip added to the project doesn’t match the project settings, Premiere Elements offers to change the setting automatically (but you can’t change it to something else later). In my case, it automatically chose “Sony XDCAM EX 720p,” whose name doesn’t match my G11’s settings (720p being an HD variant), and which is actually the format listed for “Flip Mino and Ultra 30p”. But it was the correct setting. Once a project has been set, you can add clips of different formats and resolutions, and the software scales these clips to match. That could mean reduced quality, depending on the clips (say, adding SD clips to an HD project). 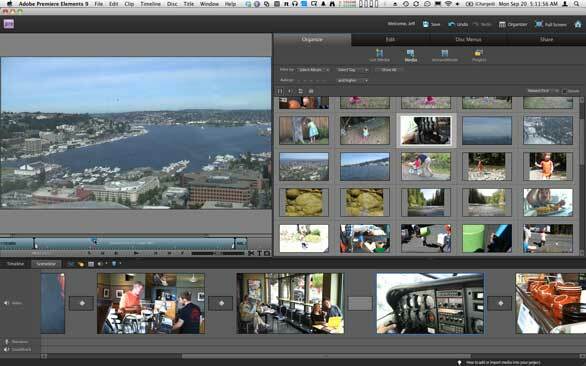 One of Adobe’s trumpeted achievements in Premiere Elements is native support for clips recorded in AVCHD (Advanced Video Codec, High Definition) format. Many camcorders save high definition footage in that heavily compressed format to store more data on memory cards or internal hard disks. To improve playback and editing performance, iMovie and Final Cut Express first transcode AVCHD files to AIC (Apple Intermediate Codec), a time-consuming process that creates large files. Premiere Elements is able to import and edit AVCHD footage without transcoding, saving time up front when you’re eager to edit. 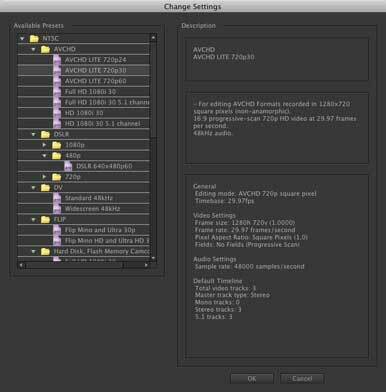 While trimming and arranging AVCHD files, peformance was fine on my 2010 MacBook Pro (2.66GHz Intel Core i7), and on a 2009 Mac mini (2GHz Intel Core 2 Duo). Adding elements, such as titles, effects, or overlapping clips on other tracks, however, caused the playback to drop frames in order to keep up with real time. Playback was often still acceptable, but not ideal, depending on what was applied; adding the processor-intensive Stabilizer effect to correct jittery footage, for example, brought playback nearly to a halt. In those cases, rendering the clips (where the edits are combined and written to disk temporarily) improved playback. Rendering is de rigeur for most video editing systems like Final Cut Express and Final Cut Pro, but that could be annoying for people now accustomed to iMovie ‘09, which doesn't require rendering. The Organizer isn't just a video vault. When activated, it automatically analyzes clips for characteristics such as blurry frames, high contrast lighting, and the presence of people, and applies smart tags accordingly. The Auto-Analyze feature does a good job performing a first pass review of your footage, marking things you’d likely toss or keep due to such characteristics. Tagging is key to many helpful features in Premiere Elements, such as Smart Trim. Potential problem areas are marked on the timeline, with pop-up notes describing why they were flagged. You can then remove a section, which is automatically replaced by a quick cross-dissolve transition to cover the edit. Smart Trim marks frames that may suffer from quality problems to help you excise unwanted footage. But little annoyances mar the utility of the Auto-Analyzer and Smart Trim. If you apply the edit in the Sceneline and switch to the Timeline panel, you'll see that the clip was not split, and there is no transition object there to let you change the type or duration of the break. Also, the Auto-Analyzer feature detects what it thinks are scenes, splits them into separate clips, and lumps them into a scene group. That's fine when importing a long block of footage from tape, but the feature also chopped up a few continuous shots I recorded with cameras that save to memory cards, where each clip is recorded as a discrete file. Once split, there's no way to easily make Elements recognize the fragments as a single clip, nor is there a way to turn off scene detection; you must expand one in editing and delete the others. One thing that definitely sets Premiere Elements apart from its Apple cousins is built-in capability to create DVD projects from the movie, including chapter markers and theme menus. If you need to share projects on disc, you don't need to hand off the project to another application, such as iDVD. The feature doesn't boast nearly the amount of customization as iDVD, and the supplied templates travel all over the map in terms of style and professional appearance. For those who want the presentation features of a DVD, the Web DVD feature creates a Flash-based version of a DVD template for saving on a hard disk or for uploading to a free account at Photoshop.com or your own server. Premiere Elements also knows which way the online wind is blowing, and has added support for uploading media to Facebook—sort of. The feature does not appear in the Share panel, as you might expect (even in the Online option to “Upload to video sharing Websites”), but is located in the Organizer. So, if you want to upload the video you just edited to Facebook, you can’t do it directly: you must export the video to your hard disk, add the video to the Organizer, and then upload from there. The Elements 9 Organizer stores your video files (as well as still images and audio files), and applies smart tags to the contents for use with many Premiere Elements features. Despite the array of features in Premiere Elements, several annoying aspects recurred that distracted or impeded my editing. In every video editing application I can think of, the spacebar is a universal Play/Pause button. In Photoshop Elements the same is true, but it depends on where you are in the program. Countless times I pressed the spacebar to play a clip and nothing happened because the Tasks panel was the last area in which I clicked, not the timeline or the Monitor panel. At times, the interface demonstrates a surprising lack of interactivity. Dragging to increase the height of a track in the Timeline does not animate the action, so you click to drag, reposition the cursor wondering if you actually clicked in the right place, then release the button, at which point the track height changes. Not only does it feel un-Mac-like, but it’s un-computing-in-the-twenty-first-century-like. In the Sceneline, the timeline in the monitor performs an irritating animation when you put the playhead into another clip. The timeline centers the playhead in the window and zooms in to expose more of the clip’s duration for finer frame control. That sounds helpful, but the result is a four-second wait every time you position the playhead into a new clip and release the mouse button. Clicking once to position the playhead in the previous clip (top) causes that clip to expand to fit the middle of the timeline (bottom). When attempting to import video from an iPhone 4 and an iPhone 3GS, I was not able to successfully use the media capture module in the Organizer to import media. In Premiere Elements, there are two import options, one under Video and one under Photos; the former worked fine, but the latter crashed Adobe’s media importing utility. (Adobe is looking into the problem.) Transferring clips to my hard drive using Image Capture first and then importing them worked fine. Adobe Premiere Elements 9’s strengths lie in its multi-track editing capabilities, along with editor-friendly features such as Smart Trim and DVD creation and burning capabilities within the program. Although I found several irritations with the Sceneline interface, the program provides a simplified environment for casual editors that quickly leads to the expanded options of editing on the timeline, especially for how much flexibility you get for the money. Get your feet wet with the Sceneline, use it to learn more advanced editing, and then abandon it altogether for future projects. If you’ve been looking for a replacement for iMovie HD 6, but haven’t wanted to jump into Final Cut Express, Premiere Elements 9 offers a way to make the transition toward more advanced video editing techniques. However, the Sceneline mode might present too many irritations for longterm use. Still, the program does offer a wealth of video editing capability at a competitive price. Stores, ranks, and tags video files with the Elements 9 Organizer. Lack of expected interactivity and responsiveness from the interface for a Mac application.